You'd think no one would want to be walking a prison yard with an elderly Chihuahua. But such is the charm of a dog named Chiller. 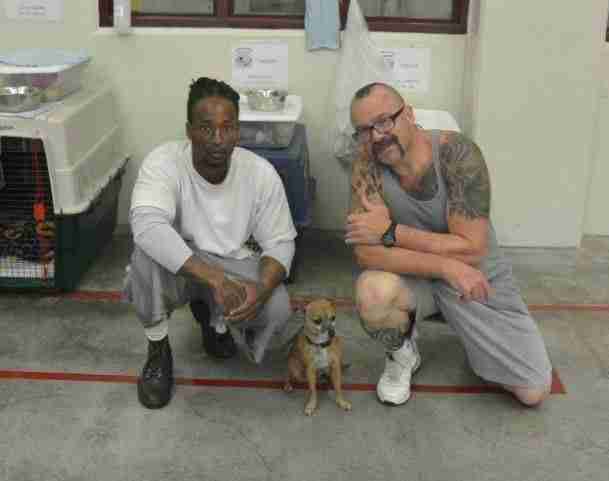 These inmates at California City Correctional Facility can't get enough of the 9-year-old shelter dog. They're co-training, co-parenting and co-loving Chiller, thanks to an innovative new program that pairs shelter dogs with inmates. "They all want more masculine dogs," Zach Skow, founder of Marley's Mutts, tells The Dodo. "It's really cool to see them with Chiller." The program, called Marley's Mutts Positive Change Prison Program, aims to change lives through the universal bond of canine companionship. 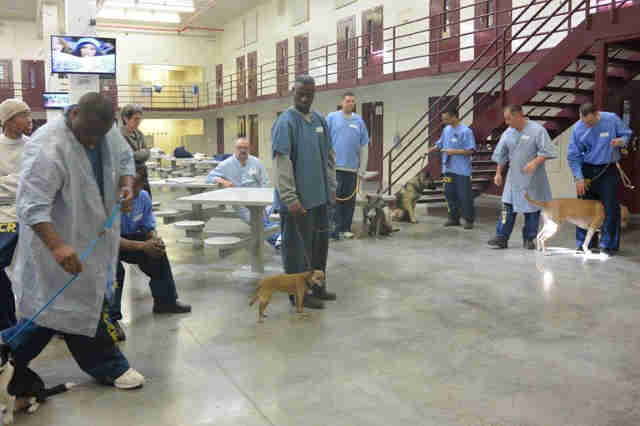 Each inmate is getting valuable life skills and job skills - and so, too, these once downtrodden dogs. Rehabilitation can be a two-way street, and perhaps at the end of that street lies redemption. Few dogs could have used it more than Chiller. For most of his life, his world didn't stretch beyond his owner's side. 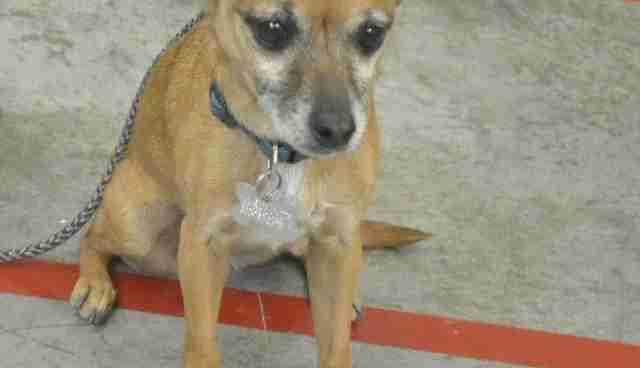 So when his owner took his own life, police officers found the now-9-year-old Chihuahua hovering over his body. And so a different world opened to Chiller at Kern County Animal Services. Scared, anxious and not very social, Chiller didn't seem long for it. "He looked terrified," recalls Skow, who saw him when he was visiting the shelter to look for dogs for the prison program. 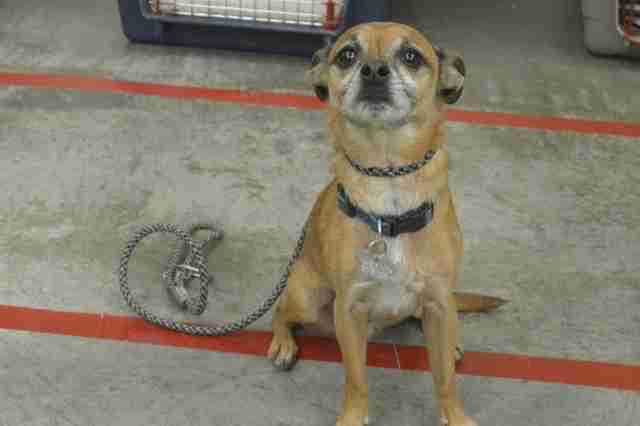 "He didn't display well - an old Chihuahua in a kennel by himself." He probably wasn't going to make it without a lifeline. That lifeline would the program Skow established in February. So Skow took him to prison. Now Chiller lives at the facility along with six other shelter dogs and 17 inmates. Their kennels are just outside the cells, in the yard. 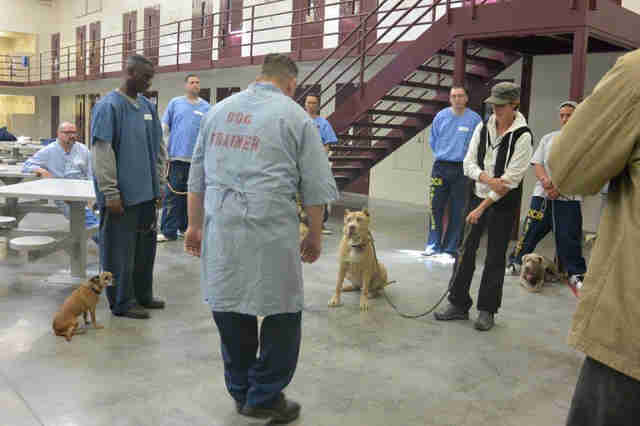 They spend almost every waking moment with their trainers - the 17 men enrolled in the program, many of whom have taken it upon themselves to proudly emblazon 'Dog Trainer' on the back of their prison uniforms. And now all the doors in the world are starting to open for the shelter dogs and inmates alike. Chiller in particular is getting some much-needed training. He sits, stays, comes when called, lays down - even navigates an obstacle course. His confidence is skyrocketing. At the end of the course, Chiller, like all the dogs, will take a "Canine Good Citizen Test." If he passes, he gets a certificate. Ultimately, the training and bonds they make here will serve these dogs well when they're back up for adoption. And, in turn, they're changing the lives of humans. "It's really impressive," Skow says. "[The inmates] journal about it every day. 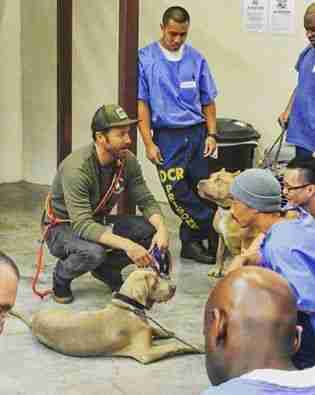 They have to do their own breakdown of what the dogs are learning, the pros and cons of their time at the prison. "Our purpose behind this program is to get them to talk openly and understand what they are feeling personally." About their situation. About their past. About their future. Feelings. The one F-bomb you generally don't drop in prison. Kind of like being seen with a small dog. But then again, this is a special kind of program. And Chiller is a special kind of dog. 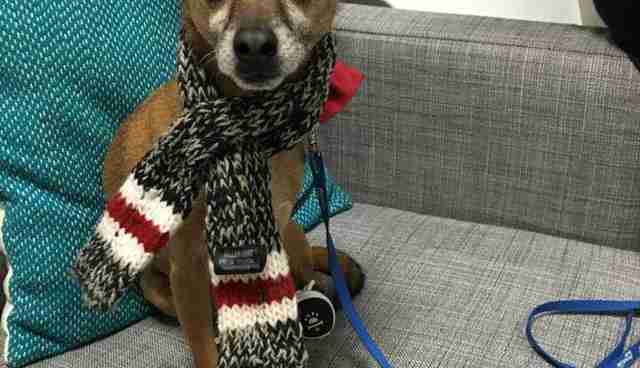 Want to support Marley's Mutts and its mission to help countless dogs in desperate straits? Consider making a donation.